Young readers brave enough to face wicked pirates, cunning bandits and terrifying monsters of the deep are in for an exhilarating treat. These 11 thrilling and fabulously illustrated stories - all thoughtfully abridged for maximum suspense and fun - will feed children's appetites for adventure. 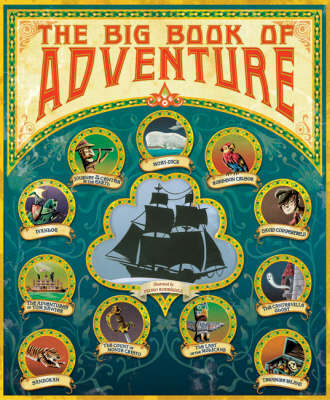 And they come from some of the world's greatest adventure writers, including Daniel Defoe, Jules Verne, Charles Dickens, Robert Louis Stevenson, Oscar Wilde, Alexandre Dumas, Mark Twain and Herman Melville. Ghosts and pirates, knights and noblemen, sailors and swindlers - children will meet them all as they pore through such exciting tales as "Ivanhoe", "Last of the Mohicans", "Journey to the Center of the Earth", "Tom Sawyer", and "The Count of Monte Cristo". Beautifully designed, with a die-cut cover and author biographies, this will become a favourite on every child's bookshelf!